The Itty Bitty Kitty Committee: Her Auction is On! 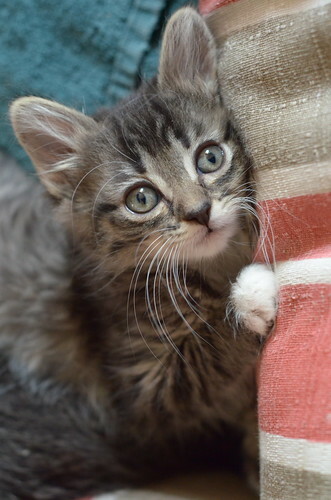 The naming rights auction for our tiny Tabby girl just went live! I had intended to make it a 3-day auction, like all the other first name auctions, but by accident I listed it as a 1-day. SO, this one is a short one! If you want to bid, act fast! To visit this auction, click HERE. And to see all the live auctions, click HERE. When do we get to know the surname choice? I'm excited! Omg I adore this little tabby girl. Man, things sure are moving fast. I didn't even know the long-haired orange boy was up for auction too. What an appealing photo -- her little paw up against the cushion and her little face saying, "Won't you love me?" Yes, yes, little one, I will!